Hello friends, I hope you're all having a nice week. We recently had some nice spring weather and then the weather turned really cold. I sure hope it warms up soon. It's been a while since I've done a beauty post, so I'd love to share with you one of my favorite hair products. If you are new to my blog, I occasionally like to share my favorite makeup, nail polish, or maybe a hair product I like. You can visit some of my other beauty posts HERE. 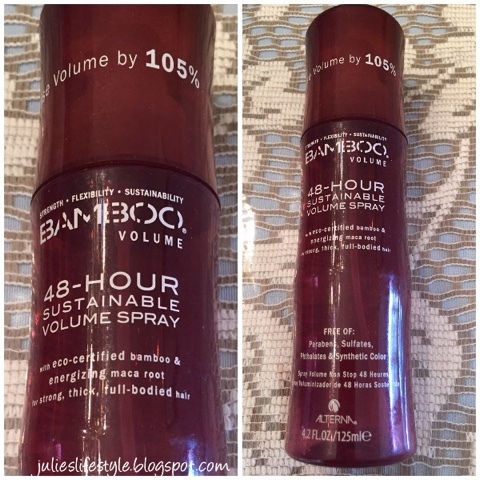 I love love love this hair volume spray! I unfortunately, happen to have very thin and fine hair. I discovered this spray when it was recommended to me by a sales associate at the Sephora store. I use this product all the time and it works great on my hair. If you like volume in your hair, then you are going to love this product too. This spray is available in these stores; Sephora, Ulta, and online at; Amazon, beauty.com, glossybox.com, and at most fine beauty salons. The price is $25 in most of these places, but I saw it available online at Amazon for $14.61. What I like about this spray is that there is no smell to it either! A lightweight, highly effective spray that is clinically proven to increase volume by 105 percent. This spray provides full-bodied volume that lasts 48 hours. Its super lightweight formula contains plumping technology specifically created for those with even the finest hair types. Free of a sticky or crunchy finish, it significantly enhances volume leaving hair visibly thickened and noticeably denser. The ingredients contained in this product are eco-certified, fair-trade compliant, and certified organic. Their production and sale aid in supporting the development of local communities while remaining environmentally friendly. This product does not contain gluten, TEA, or DEA. Clinically proven to increase volume by 105%. Do you have a favorite hair product that you like? I'd love to know! ** This is just my opinion of a hair product I love! We hope to see you all back here on Monday for Cooking & Crafting with J & J! I'll have to check this out! I use regular old hairspray but this stuff looks really good! I don't use many hair products but I wash it with Wen and only once or twice a week. I have thin hair too and I always have a hard time finding a hairspray. This one looks like it's worth a try! I wonder what it smells like, Julie? Thanks! I am right there with you and I plan to check this out. Why do things have to change as we age??? I have fine hair too and thinned growing older...so this products is one I'll check out. Otherwise my hair lies limp on my head! I also like its more natural which is a big thing for me! Julie, you know that ladies love these posts. We are always looking for the next best thing. My hair is thick but fine and straight. In Texas we like a little volume. :) Thanks for recommending this and thanks for joining Thoughts of Home on Thursday. My hair is fine and thin too so I can't wait to try this! Your post is such a happy addition to Thoughts of Home on Thursday. Thank you SO much for sharing the joy. Thanks for this review! I used to have thick, curly hair, but now it's lost its bounce and has thinned out, too, so I may give this spray a try! I rarely use hairspray, but when I do I definitely prefer one that adds body so this is going on my short list to try. Thanks Julie, and stay warm! It's going to be really cold today :(. I like how it is not filled with a lot of junk. I don't use spray, but passing on to my daughters who do. This is a product worth checking out...maybe it will add some oomph to my thinning, fine hair...thanks for the review! Great product and it's worth to try.. I have very thick, frizzy hair that is hard to control. I need the opposite of volume spray, lol! Sounds like a good product to try. My hair is very fine too. I love that you shared this review with us. In Texas we have some humidity and my hair has natural curl so it can become very frizzy especially after a day in the garden. It sound like you found a treasure. I have fine hair, too, and hope to try it! Thank you for telling all about it. Thanks for the review Julie. I find that some hairsprays make my hair too stiff so I enjoyed your review. Thanks for sharing with us at Over the Moon link up and have a lovely day. I haven't seen this product before. My holy grail of hair care brands is an Australian company called bhave. Their products have made such a visible difference to my hair its amazing. Sounds like a great product Julie. I had not heard of it before. My hair is very fine, but hairstylists say I have a lot of it. I think it would work good on my hair! Thanks for sharing with SYC. Thanks for sharing your review with us at Merry Monday. It sounds like a product worth trying.